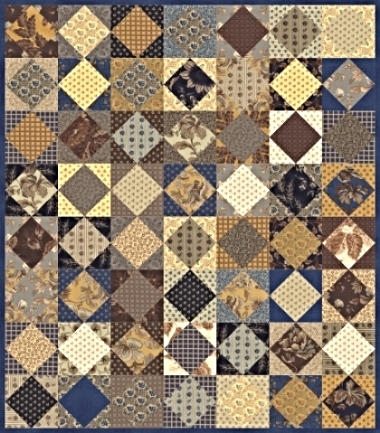 this giveaway at ROCKING CHAIR QUILTS has ended. As the holiday merriment is winding down, so begins the winter season. Absolutely a good time to settle in and make some pretty quilts . Don't you think so? We can help with the making of quilts by offering you the opportunity to enter for a chance to win this week's prize bundle. What's included in this week's giveaway? A QUILT KIT; FRIVOL # 3- HERITAGE- CONTAINS ELIZA'S INDIGO FABRIC BUNDLE BY MODA FABRICS, YOUR PATTERN, A BONUS PATTERN AND A SURPRISE, ALL PACKAGED IN A COLLECTIBLE TIN THAT MATCHES THE FABRIC INSIDE. Eliza's Indigo fabrics- enough for your HERITAGE quilt back and binding. AND -THIS USEFUL TOOL - CLEARLY PERFECT ANGLES. IT'S A TEMPLATE THAT 'CLINGS ' TO THE BED OF YOUR SEWING MACHINE. 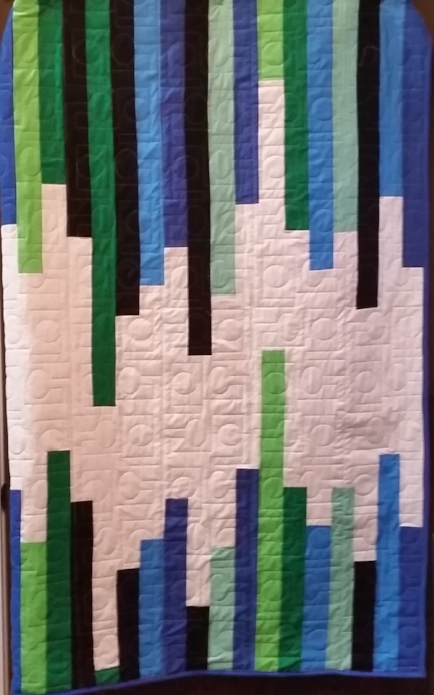 Here is a photo of what the HERITAGE QUILT looks like. Enter up to 4 times using the Rafflecopter widget (the WHITE BOX below) . Contest ends JANUARY 7th 2016 at Midnight CST . MSR VALUE of BUNDLE $98.00 USD. For complete rules click HERE. THANK YOU SO MUCH FOR BEING A PART OF OUR GIVEAWAY. Party in the quilt shop! Here is a glimpse of our shop entrance & some of the prizes in this weekends shop opening celebration. We wanted to include all of our online customers in the fun . We could not have come this far without your support. Our vendors have been very generous donating prizes for all of you & we have sweetened the deal by adding some fun prize items from our shop too! Enter online- Click on the white Rafflecopter box below and complete your entry. Enter at the shop - If you are near us- come by on Friday and Saturday, April 10th & 11th to enter. Contest ends Saturday April 11th, 2015 at midnight CST. This giveaway is open to all our international friends too! Click inside the WHITE box below to make your entry.